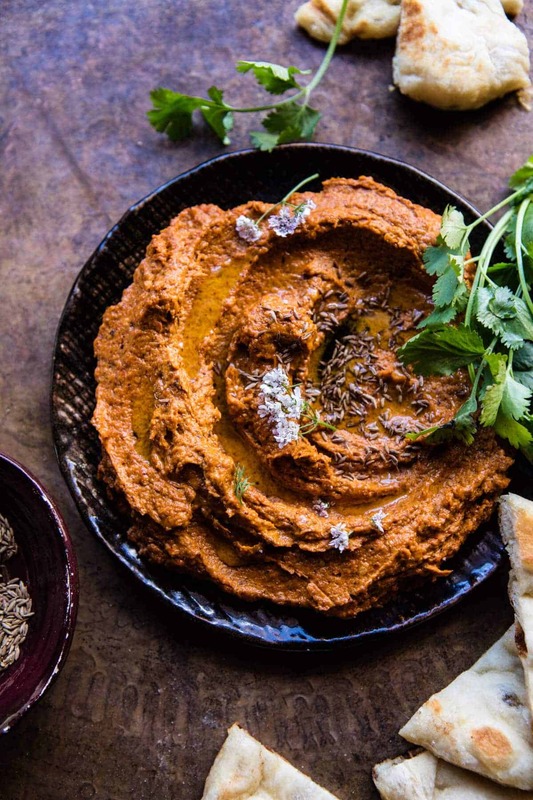 AKA roasted red pepper and walnut dip!! 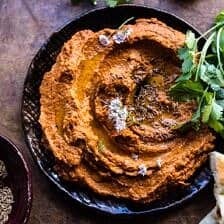 If you’re new to Muhammara, it’s a pureed roasted red pepper and walnut spread/dip commonly made in the middle east. 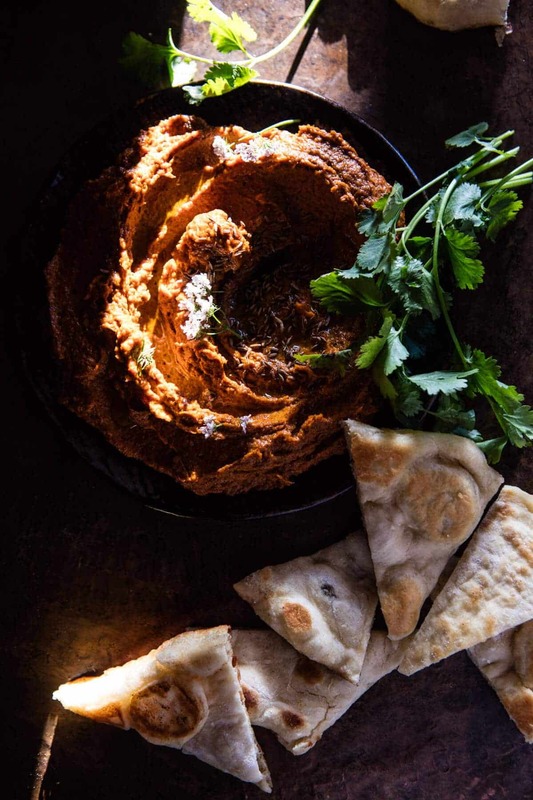 It’s completely addicting…especially when served with a side of homemade naan or pita chips. Along with roasted red peppers, this muhammara recipe also includes sun-dried tomatoes, which adds a slight sweetness to the spread. Top it off with a little olive oil, toasted cumin seeds, and flaky sea salt…SO GOOD. This recipe makes a lot. Therefore, I’ll often make it on a Sunday and snack on it throughout the week. This spread is also great for livening up a meal, simply serve it alongside a roasted chicken, sandwiches, or even a salad with some naan. Obviously, it’s also awesome as an easy and healthy appetizer. Perfect for the warmer months of the year when you’re wanting to serve a lighter spread, or a spread that can sit at room temperature for a while. Adapted from Dinner: Changing the Game by Melissa Clark. In a food processor, combine the roasted red peppers, sun-dried tomatoes, olive oil, lemon juice, garlic, cumin, paprika, half the walnuts and a large pinch of both salt and pepper. Pulse until completely smooth and combined. Stir in the remaining walnuts. Heat a small skillet over medium heat and add the cumin seeds. cook stirring often until toasted, about 3-5 minutes. Spread the dip on a plate and drizzle with olive oil. Top with cumin seeds and salt. 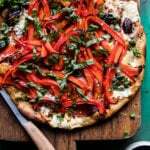 Mediterranean Roasted Red Pepper Pizza. Hi, Tieghan. This looks sooo good! But my husband is allergic to walmuts. What can I use as a substitute? I wanted to ask the exact same thing. I’m allergic too, but would love to eat muhammara again. Do you have any ideas that we could try to create a similar spread? Sunflower kernels maybe or something? Ps. I love the pictures! 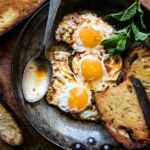 Whenever I am in a cooking slump, I only have to look at your gorgeous photographs and I’ll feel instantly inspired! I made this today but used pepitas instead (sunflower seeds). I would imagine you could make using any sort of fatty seed (hemp, etc). Not sure if that would help out on the allergy front. Seriously yum, I want to snack on this spread all week long! Ah yes! its my fav little snack! Even though I love it, this would be a nice break from hummus! Looks super easy and will be really good as a side dish to chicken or beef kebabs. Yum! Hummus is great! But this is a nice change up, hope you love it Alice! THIS.LOOKS.AMAZING. 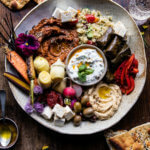 about to get my muhammara on – i have a feeling snacking will never be the same! I hope so! Also hope you love it. Thanks Jess! Perfect for a party with friends! Oh lord, I can’t even. This is so me! Pretty much how i feel about this one! I’ve had too much hummus so I was excited about it too! Just curious if you roasted the red peppers yourself or used a jarred variety? I definitely want to give this a try! Oh. My. Gosh. OMG! This might be one of the most amazing foods I have ever tried. I’m not sure what I was expecting it to taste like, but it passed my expectations one million percent!!!!!! I literally just made it and all of the dirty dishes are sitting out still, but I had to comment because everyone should make this!! You are the bomb! For Real! WOWWOW!! Thank you so much Sarah!! Haha! SO so happy you liked it so much! Hi! Love your site. I’m in the market for a new food processor. What make/model do you use, or would you recommend? Thanks! I use a 16 cup cuisnart! I have also hear KitchenAid’s are great too! Fabulous yet so easy to make – I used bottled roast peppers which seemed to work well and next time I would reduce the amount of lemon juice to half a lemon’s worth, for me the juice of 2 (medium sized) lemons ended up being just too much – that will teach me not to taste as I cook! Thank you Keith! I am so glad you liked this! Love the imagery and what a fabulous dip but you might want to ease off on the lemon juice 2 tablespoons worth should do it? 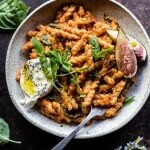 Sorry, old age must be setting in I see I commented on this wonderful recipe back in January! No worries! I am glad you enjoyed this recipe, Keith! Thank you! 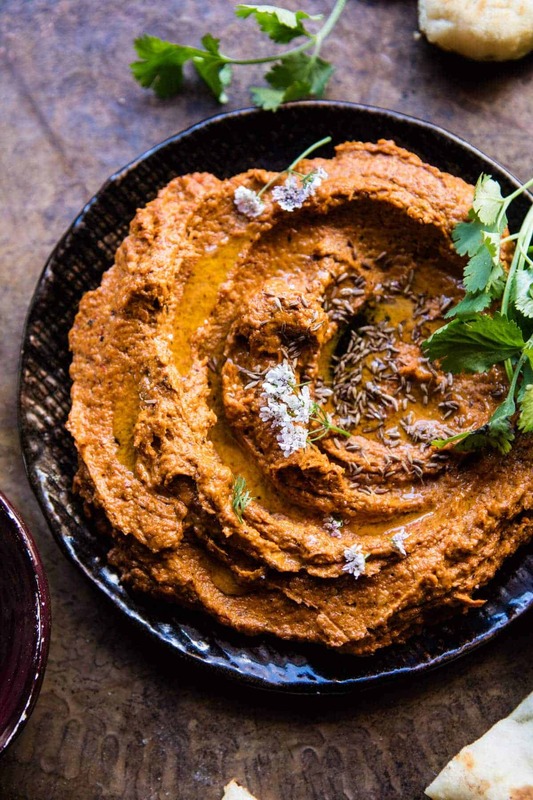 Hi Tieghan – making this dip for a party and wondering if it’ll stay good in the fridge if I make it a few days in advance!